i should be packing because we move into our new house in 6 DAYS (!!!! ), but in classic me fashion i am doing what is more fun... making an inspiration board! you may remember when i first revealed that we were buying a house that i mentioned i wanted open cabinets in the kitchen. i would love to paint the inside a bold color and have beautiful white dishes saying hello to me every day. alas, i do not have white dishes. when my husband and i registered for our wedding we were SUPER young. i was 21 and he was 23. babies. babies i tell you. which meant all our friends were babies. we didn't get any of the pretty dinnerware we registered for and i think i only got 1 place setting of the utensils. hahaha! i'm not complaining about it, i mean, i totally remember being young and broke (shoot, i'm still young-ish and broke!). and the dishes i have now i have totally loved FOREVER, but they are bold. black and white damask. i wanted them sooooo badly for my birthday four years ago. but some days i just wish i had clean, plain white dishes that i could interchange with different colors, for different occasions. i think every home should have a set of white dishes. something classic you will never get sick of. No. 1} a few weeks ago at church i ran into my friend Cambria, who just got married, and she was holding this glorious coffee mug. all the sudden the heavens parted and i totally forgot what i was talking about. all i needed to know what where she got that beautiful piece of dinnerware from. she said Macy's. i instantly went home and looked it up. *SWOON* it's their Hotel Collection Bone China. and not only is the mug awesome, so is the bowl! so important. i judge a good set of dinnerware harshly based on the mug and bowl. for a set of 12 place settings it would be $232.00. yikes. i'm a cheapskate. No. 2} since the hotel collection is out of my budget i scoured the internet for similar dinnerware. The Cellar Whiteware Rim is pretty darn close. the bowl is massive, and the mug is descent, but the rim on the plates is not as defined as i would prefer. but at a measly $126.67 for a set of 8 place settings, it's looking better every second! No. 3} my 3rd fav is the Gorham Brekinridge Bone China set. it has almost all my favorite features, but the mug is leaving more to be desired. it does however come with an extra tiny plate for under the mug, for only $10 more than The Cellar. i guess that's cool. for a 40 piece set it is $136.49. No. 4} i have always loved the Aspen Dinnerware set from Crate & Barrel (i always say it in a strong Scottish accent, just for kicks) and i love it even more now that it is on sale. for a set of 8 place settings it's $125.00. not bad. but... i'm not in love with the mug. i love another mug. i'm having an affair with another mug. crate & barrel does offer this place setting set with the other mug, but it has a different BOWL. wha!? so i would have to spend an extra $40.00 just for 8 sets of mugs. that's a total of $165.00. No. 5} i also have always loved the NeoBaroque Dinnerware set from West Elm, but i think it would end up just like my black and white damask set... not timeless enough. plus, the dinner plates aren't even available anymore. *tear. whew. i never knew i was so opinionated about plates. welp. now it's out there. i would be happy with any one of these as a gift for any occasion. if i never get it as a gift i will just save my pennies. either way is fine! 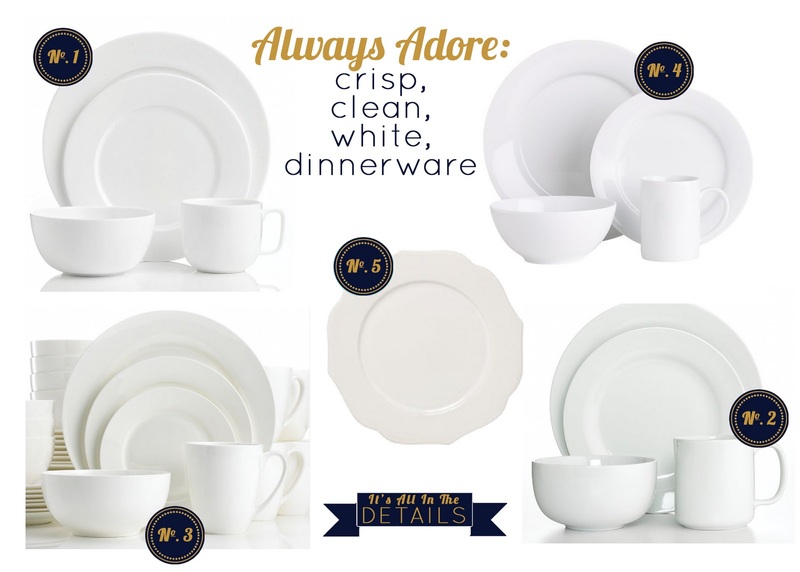 I agree with you on white dinnerware, best decision I made when we registered! I love mine!! Can't wait to see your house, we move in 2 weeks! Yikes so much to do. pack it up, pack it in!